- Good evening everyone and welcome back to Transformation Tuesday. Welcome back to another episode. 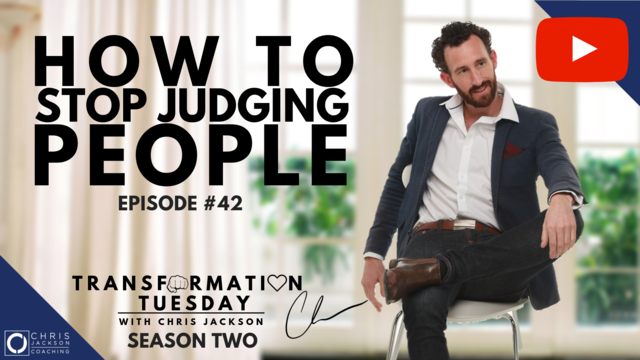 Tonight's episode is on how do you stop judging people. This is a question I get asked all the time by the clients that I work with. This is a doozy. This is something when you understand this and when you tap into this one, you watch your life transform before your eyes. You watch your happiness go to a whole nother level. You watch your love of fulfilment and your ability to be a professional human being radically just go to levels beyond what you even thought was possible. This is a powerful concept tonight. Hey Denny, good to see you here mate. And it's something that again as usual, a lot of these topics, I'm sharing them and I say I wish I knew about this concept many many decades ago. I'm glad I know about it now and I'm glad to be able to share it with you because this is a powerful concept. There are many levels of mastery of this concept. Hey Katrina, good to see you here. There are many levels of mastery of letting go of the need to judge people. Being more compassionate, ultimately tapping into a more loving state of being, being more authentic and just generally getting more out of life. So if you can relate to wanting to let go of some of the negative charges in your life, if you're wanting to offload some of the resistance, some of the resentment, any of the negative feelings that you've got towards anyone including yourself, then this is going to be a powerful episode for you tonight. And I'm going to extend upon a lot of the concepts that I usually teach, and as always we're going to go with some practical applications of how do you apply this in your life, what are some of the questions you're going to ask yourself, how do you turn this into a thing you can integrate into your life? So first of all, thanks for joining me, as you're jumping on guys give us a shout out. I'd love to know where you're tuning in from around the place, I know there's a few of you that are coming in from Perth. Hello, good to see you, good to have you back on Transformation Tuesday. We first of all need to unpack, as usual, why are we even having this conversation? Why is it important that we stop judging people? That's the topic for tonight, why is it important? Well the reason why, hey Denny, Dee's coming here from Perth, good to see you, I'm looking forward to doing our interview tomorrow brother, we'll see you tomorrow. It's really important that we actually ask ourselves the question why is it important to not judge someone? And we need to actually create a compelling reason why this is even important on the first place, otherwise this whole conversation we're having tonight is a waste of time. So the reason why it's important to stop judging people is because if you want to experience the highest level of happiness, if you want to experience love for self, a sense of worthiness, a sense of fulfilment, and a sense of going through life resistant free, or as resistant free as you possibly can, then understanding how to let go of judgement of others as well as judging yourself is one of the most powerful concepts you're ever going to know. And this is a concept that children need to understand from birth, this is a concept that adults need to understand, and when we understand this it's liberation of the mind. This is how we become truly free of suffering when we understand these concepts. So let me give you an example of what do I mean by judgement , what are we talking about when we say stop judging others? What I'm talking about is judgement is the need of the ego, judgement is the need to diminish, to criticise, to invalidate, it's a fear based expression. When I say it's a fear based expression, it's an expression of the ego, it is one of the needs of the human being which is to diminish, to criticise, which is all coming from a place of fear. If we're in a state of love, if we're in a state of abundance, we don't need to judge, we don't need to diminish, we don't need to criticise. And the key distinction here really is recognising, well one of the big myths that exists in personal development and in consciousness in general, which is this. A lot of people feel like they actually need to judge people in order to survive. A lot of people feel like they need their ego to survive, now I want to first of all unpack this myth which is you don't need to judge someone in order to make decisions. The key concept here that some of you guys that have been to my seminars and trainings before will be very very familiar with is the distinction between the difference between judgement and discernment, also known as preference. So this is a powerful concept, and this concept will deepen and deepen and deepen to many many layers and many many levels. So even if you've heard this concept before, tune in from a different lens tonight and see how it applies in a different way. Great to see you again Mike, welcome Angela. So we need to understand this distinction between judgement and discernment, because a lot of people think, well let's look at some examples. Let's look at some examples like, a lot of people get confused about this, so I really want to clarify this. A lot of people think well, aren't there nasty and dirty things in this world that we should judge? Isn't there some horrible things that we should all fight against and get all angry and uptight about? And my answer to that is no. You don't need to get angry, frustrated, resentment, resentful, aggressive, you don't need to do any of that, you don't need to indulge in any negative emotion in order to exercise your sovereign right to choose what you want to experience. Let me give you an example. Let's look at the concept of murder, it's a very very extreme concept and I want to give you an extreme concept to unpack it. The concept of murder, now you can look at murder and you can get all frustrated and angry and bitter and resentful, or you can look at the concept of murder and go, well you know what? It is what it is, do I prefer to indulge in that behaviour? Do I like it? No not particularly, but do I want to fight it? Do I want to indulge in a sense of criticism, and do I want to create a negative charge around that so that I feel horrible, so that I feel like I'm suffering? Well the answer there is we can simply exercise our preference, which is well I want to live in a world without that, but we don't have to judge it. Now this is a powerful concept. You can choose your preference which is to avoid something or to not experience it without the negative charge, that's called discernment, that's called operating out of a very high state of consciousness, which is operating out of preference. Now a more simple example to illustrate this point is going to be something like if you're going out with friends and you're both walking up to the ice cream counter and you've basically got the option of chocolate or vanilla. Now let's just say for example if you love chocolate but your friend doesn't like chocolate. Well your friend could look at your choice and go oh that's horrible, how can you order chocolate, that's disgusting. Or they can just accept it, they could say well look, that's your choice. Now the thing about this judgement versus discernment or preference, is this is the concept that liberates the mind. This is the concept that when we understand this and when we apply it, we realise that a-ha, we can operate out of preference, we can operate out of choice, out of discernment, and we don't need to indulge in the negative emotions that come with judgement , so this is a powerful concept to know. We never have to indulge in the negative charge, in the criticism, in the resentment, in the bitterness, and in the negative energy of anything. Now it doesn't matter whether we're talking about murder, whether we're talking about terrorism, we could be talking about the most extreme thing in the world. You simply have to say to a concept like that if you don't want to indulge in judgement , not my bag, it's not my thing, I don't resonate with it. I prefer to do something else, prefer to experience something else. So we don't have to indulge in the judgement , so the judgement pretends to be necessary. The ego will tell us that judgement is necessary but it's absolutely not. So this gives us a sense of lightness about how we approach our world, this alleviates something, this is the antidote, this the root cause solution to alleviate suffering at the highest level of consciousness when we understand its concept, and that way we don't need to do all the patch-up work, we don't need to indulge in a lot of the therapy and a lot of the suffering, and a lot of the conversations that happen as a result of the damage that gets created from judgement , so this is a really powerful concept. G'day Daniel, good to see you here mate. So we really need to understand that judgement is not necessary. We can operate from a place of discernment. Once we create that awareness of that distinction, what we can now get open up to is a whole new world of oh I don't have to judge, I don't have to diminish, I don't have to criticise something anymore. I can now move beyond that, I can now have acceptance of something. Now here's the next critical variable or concept you need to understand. Acceptance of something doesn't mean we condone something. Acceptance of something simply means we let go of the attachment, we let go of the resistance, and we let go of the need to control something and we just say what is is what is, and I'm not going to buy into the emotional drama of making that mean anything. So what happens is we let go of our need to control, we let go of our need to manipulate things to our will and we just surrender. Now that doesn't mean that we become complacent, acceptance does not mean complacency, they're two different concepts. Acceptance means letting go of the need to control, the need to judge, and the attachment to something, it's just simply a surrendering. Complacency would be not taking action or not making choices in alignment and not being empowered to make the choices that are in your highest expression. However, acceptance is a letting go of the suffering. Once you let go of the suffering, you're now freed up to make a higher level of conscious decision making process so that you can make sure it's in alignment with your higher self. So that's a key distinction I think that's really worth pointing out there. Because a lot of people think oh I don't want to accept the behaviour, I don't want to accept that there's things like terrorism or murder in the world. Well acceptance doesn't mean complacency, acceptance just simply means that you've let go of the suffering, you let go of the negative charge, you let go of the attachment. And this is a concept, it's a really really powerful concept called detachment, which is a letting go of the need to control, the need to know, the need to be able to force things to our preference, that's complete detachment. Attachment to things is one of the core needs of an ego. Our ego feels like we need to control, our ego feels like we need to know, our ego feels like we always need to protect at all times, so this is a concept that we need to be aware of, that we are letting go of the need to be attached to something, powerful to know. So the next step that we need to understand is well we've got to first of all identify, well what are we actually, what do actually, why do I want to stop judging? Now the thing about this is we've got to get clear on what are we actually judging in the first place? What are we even judging? So that's the first step, is awareness. As always we've got to create awareness of what are we even judging in the first place. Now you might be judging a person, an idea, an emotion, a thought, you might be judging yourself, you can be judging a behaviour, you could be judging a cat, a dog, a pet. You could be judging anything. You've got to get clear on what are you actually judging, where is the diminishment, where is the criticism? Now as soon as you can identify what you're judging, you can identify what aspect of that are you judging? So this is the core, this is the starting point. What are you actually judging? And when you can identify what you're judging, well you now have power to let go of it. If you don't know what you're judging and if you don't even know if the judgement is taking place, well you're in a position of disempowerment, because a lot of people are experiencing their life where they're unconsciously, and I can relate to this I spent the most part of my life judging people and I had no awareness of it. Now what I encourage you to do as an awareness exercise for this week is recognise where you're actually judging someone instead of coming from a place of discernment. Now I did this when I walked around the streets of Scarborough, I actually walked around and I actually spotted where's the judgement . I was identifying that I was judging shop fronts, I was judging people that were holding skateboards, skaters, I was judging people that were overweight. My mind and my ego, I'd started to observe wow, I'm judging all these people, I'm judging an overweight person, I'm judging a person who is smoking. Oh jeez, I just judged the person who tooted their horn in their car. And so when you turn this into an awareness exercise, you now have the power because you can now observe self, you can now observe the inner workings of your consciousness and that is the way to override and hack your consciousness at the deepest, most powerful level. So you want to send yourself an awareness exercise to identify what are you judging. So that's always the first step, awareness. And as I said it could be a person, a concept, an idea, a car, a house, you could be judging anything, judging yourself, aspects of that. The next element is to understand well what part of that are you judging? Are you judging part of your personality? Are you judging a behaviour? Are you judging the colour of someone's clothing? Are you judging their tonality, are you judging the way that they speak? Are you judging someone's behaviour, it could be someone's lying, cheating, stealing, what are you judging about them? Now again you want to create awareness of the judgement . It doesn't mean you condone it, it doesn't mean you support it, it doesn't mean you want to encourage it. All we're simply talking about here is identifying the judgement so you can let it go, you can let go of the negative attachment to it. It doesn't mean you'll make choices in alignment with doing something that you don't resonate with. What it does mean is you let go of the suffering, you let go of the attachment, so that's a powerful step there that you've got to realise, awareness. Now, we've got to get clear on how we actually want to let go of the judgement . Now the first most empowering step is realising we're judging and it's not necessary. Number one, judgement is not necessary. So if you didn't already have that learning, write that one down, judgement is not necessary. I don't have to judge, I can simply operate out of preference. There you go, that's a major universal truth. Judgement is not necessary, it's a fear based expression and it's not required. What is required is that you operate out of preference, also known as discernment, which is just using wisdom. It's using wisdom, and the highest level of intelligence to let go of the suffering. Because a negative emotion experience, when you strip away the wisdom and you separate the negative charge, right, you're left in a place of empowerment and intelligence. However, if you're left in a negative state, in a negative emotion, what's happening is that wisdom that's available is not able to be accessed because it's tainted by a negative charge. So actually in all cases you won't be able to find any case where you can see a negative emotion that doesn't involve judgement . So it doesn't matter what negative emotion you can ever conceive of. Anger, sadness, fear, hurt, guilt, resentment, bitterness, it doesn't matter what it is, there will be judgement on some level. A diminishment, a criticism of some part of that reality, so you can now look at any emotion and you can pull it apart and say okay, if we split away the judgement from that negative emotion, what we're left with is wisdom. So we take the negative emotion, you strip away the judgement , you just simply get left with pure intelligence which is wisdom, which is a very rational, logical learning from an experience. So with that in mind, what you can now do is you can now look at all the experiences of your life where you're experiencing some form of suffering, some form of judgement . Judgement and suffering, suffering is created only through the mechanism of judgement . Suffering is created through judgement , and suffering is created through the lack of awareness that we are creating all of the meaning and all of the events in all of our lives. We are meaning making machines in ultimately a meaningless world. We are the ones, we are the actor, we are the director, we are the sound of our, we're the producer of our own movie. And we're all watching the same movie but we're all adding different theme music, we're adding subtitles, we're adding meaning, we're adding emotion. This can either be a comedy or it could be a horror movie. We at all times are adding our own layer of consciousness on what this whole experience means. So we've got to recognise if we are judging someone, well that's on us, we don't have to judge them, a key concept there to begin with. Once you identify the judgement that's taking place and you identify who you're judging and what aspect you're judging, the next element here is to have what's known as compassion. And you've probably heard this one before, compassion. This is incredibly important. This is one of the most powerful virtues that you can ever tap into. Compassion is the override switch. Now there are many override switch, gratitude is an override switch, compassion is an override switch, but what I mean by compassion is understanding and love coming together and when you embody this concept of compassion, what you get access to is you can override the suffering. You can have an understanding and a level of acceptance of whatever is taking place, it just is, it's outside of the lens of a human, there's just stuff happening, there's just energy, frequency and vibration, there's just things happening. And it's our perception as a human being where we now look at something and we go hmmm, it's almost like on your TV screen of your mind, we drew a line across the screen and we go everything on that side of the screen I like, it's good. Everything on this side I don't like, that's bad. So what we're doing is we're now compartmentalising and we're creating distinctions and boxes of things that are good and things that are bad, so that's what a human being does. We compartmentalise and we make a distinction, good, bad, right or wrong. So this is a powerful awareness to have, to know that okay, judging's not required, we naturally judge, our ego is the fear based programme inside us that's going to judge things. And we can only override it once we have the ability to be aware of it. Now when you have compassion which is understanding and love you can come to a place of actually having a process whereby we no longer have a negative charge, we no longer have a sense of resistance to something because it's Like we're looking at a little baby. It's like if you're looking at a baby. And if the baby is crying and you could probably get a little upset and go oh jeez, this baby's crying, it's kept me up all night, you can get all angry, but when you look at a cute little baby in its face and it's like smiling at you, it's all good again, having compassion for this little child. Well it's the same thing in life. If you can take the compassion that you're able to generate for a beautiful newborn baby, then you can apply that same thinking, that same process, that same energy to everything in your life. It's just a strategy. You can apply compassion to everything. And the way that you do this is by cultivating a series of beliefs, and some of these beliefs are things like everyone is doing the best that they can with the resources that they've got. Everyone is doing the best that they can with the resources that they've got. Everyone is operating out of the best level of consciousness that they have available. Yes, no one's perfect, everyone's at different levels of consciousness, everyone has different learnings, hey Rod, good to see you here mate. Everyone is going to have challenges in different areas, everyone has limiting beliefs, fears, everyone has ego, everyone is trying to figure this life out, including ourselves, so we need to have compassion for ourselves and others and everything in this reality and recognise we don't live in a perfect world. The whole purpose of this life is to experience the whole contrast of everything that could ever take place which includes a lot of the go wrongs, a lot of the sufferings, a lot of the lies, deceit, people doing things that are out of alignment with love, that's the reality that we live in, including us out of alignment with loving ourselves. So we need to understand and have compassion, tolerance, forgiveness, and a level of deep understanding for where we're kind of flawed creatures in a beautiful way, we're perfectly imperfect and that's okay. So we can use these concepts and these belief systems to help us arrive and land on a place of compassion. It's from this place of compassion which is understanding why someone's done what they've done, not necessarily agreeing with it or thinking that it's necessarily something that we would want to do, however what it's doing is it's understanding okay, I can see how that person's done what they've done even though I don't necessarily agree with it or it might seem a little bit strange, coming to a place of understanding diffuses and releases that negative charge, and what it does is it frees us up from suffering. It eliminates the suffering because we can now look at someone like we would look at a beautiful newborn baby and we now go you know what, I'm going to give you the benefit of the doubt. I'm going to send you love, I'm just going to wish you the best. I don't necessarily agree with what's taken place necessarily but you know what, bless you on your way. Bless you, I wish the best for you, and that's the place of compassion, a powerful place to be, that's the override switch to suffering. Now when you have compassion for others, that's amazing. You diffuse the tension, you diffuse the triggers, what you also need to do is have compassion for self, because this reality is an inside out projection. The degree that you judge others to the same degree you judge yourself. So it's irrelevant of whether you're judging yourself or judging others, what you're actually judging is a concept, it's judging an idea, it's judging a thought, and whether that thought applies to your or to someone else, well if you have a judgement of that concept of that thing, like for example, if you were to judge, if you judge someone being disorganised, if you judge the concept of being disorganised or late or someone being impatient, if you judge that concept, then it doesn't matter whether it applies to you or applies to someone else, any time when you see and witness that behaviour, you'll get triggered, you'll get triggered. And typically it's a lot easier to see in others before we see it in ourselves, but it's an inside out process, so you've got to release and have compassion for that component, for that idea, for that component, and once you release it it releases it for self and it releases it for others, so this is an inside out process. So that's the concept of compassion that we need to develop. Now there's a hierarchy here in terms of, a lot of people say, well jeez there's a lot of people committing all sorts of atrocities in life, there's a lot of people doing some nasty stuff. How do I have compassion for them? Now that's a question I get asked a lot by my clients, is how can you have compassion for terrorists? How can you have compassion for rapists? How can you have compassion for these people who are doing these things? Very very good question. You don't have to have compassion for them if you don't want to, you can judge them and you can hate on them and you can come from a place of fear if you want, if it serves you, but one of the universal truths of this universe is the foundational base frequency that this whole thing is set up on is love, love is the antidote to suffering. So when you come from a place of love and compassion what you're going to find is that there's a hierarchy of things that you need to move through. For extreme scenarios, we have to forgive, forgiveness is taking on a position where if there's been an extreme wrongdoing, we've got to come to a place of forgiveness. Now there's like a hierarchy here, it's almost like you can work your way up to finally coming to a place of acceptance. But the hierarchy is starting at forgiveness. And once you forgive you can kind of then tolerate something. Once you now tolerate it, you can now have a level of understanding for that. Once you have a level of understanding, you can arrive at a place of acceptance. Now acceptance is neutral, acceptance is you know what, that's happened, and again it doesn't mean that we condone it, it doesn't mean that we want that to happen. What we are saying is I now hae a neutrality to it, I have a detachment to this, I no longer have any resistance present, it's just neutral, I've just nuked it. It's like it's a numbness of it's all good, I just released that from my experience. Now once you've got to acceptance, the next level is you can actually flip it and you can go to gratitude. You can now say okay, how could I be grateful for this scenario? Now that's when you start to elevate into positive territory it's when you start to kind of appreciate something that was negative or something that was disempowering, how can you view that through such a lens so that you can have an empowered learning? How can you take that and extract wisdom from some seemingly negative experience? How can you benefit from some of the negative actions of other people? That's when you can extract a high level of wisdom, and that's when you operate on a high level of consciousness, because now you can look into your experience, you can turn on the negative news and you can turn on all these things, and instead of being triggered and feeling sadness and suffering, you can go all, where's the learning for me today? Ah, I have compassion for that person, I can see why they're doing that. What can I learn from that? How can I grow from this? What's the wisdom I can extract? How can I take this problem and solve it? How can I benefit society from understanding an observing this? So you can take any experience of suffering and you can flip it and have gratitude for it, and now extract the wisdom. When you have gratitude for something, you now enter a space of consciousness when you can take that information, take that knowledge, the wisdom and apply it to solve grander problems for yourself and for the human race. So that's what I do when I turn on the negative news, and I don't watch the negative news very often, but when I watch the news I need to stand guard at the door of my mind and go jeez, if I buy into this negative news, I'm going to feel depressed. So what I've got to do is I've got to flick it and I've got to hit the compassion switch and go righteo, I can see there's a lot of negative stuff going on, how can I take some positive learnings from this, how can I watch this and evolve empowered knowing that I can do something about it, and I can expand myself. So this is some hacks of consciousness so when you use these your experience of reality, your consciousness, your happiness, your fulfilment goes to a next level, which I recommend you practise on a daily basis. I definitely recommend, my own personal philosophy is avoiding the negative news. I don't watch a lot of news simply because for me there's not a lot of empowered learnings in that. From time to time I will, but I generally stand guard at the door of my mind and I'm consciously selecting what do I allow into this device. Because knowing that everything that enters your consciousness if having an impact on you, and you've also got to be aware of how you're letting it impact you. So some cool distinctions that I think are really worth understanding and exploring. A really powerful thing here when it comes to compassion, another example, is what you can try, and you can try this out for anyone. If anyone here is in a relationship, this is particularly powerful, but it doesn't matter whether you're in a relationship, friendship, or whether you're just simply out and about walking down the street. This is a powerful tool that you can actually apply, which is going to be a powerful insight for how you approach your life. It is this, you want to turn up in life, to your relationships, to your friendships, to life, like you're a criminal defence lawyer. What do I mean? Well you want to imagine that you're a criminal defence lawyer, and your client, whether it be your partner, your friend, or just society is standing on death row. They've been tried in a court and they're about to get executed unless you defend them to the highest degree, unless you stand guard, unless you defend them to the highest degree possible, then they're going to get put to death. So you want to take on this role, play this game and imagine that whatever you're witnessing, the judgement in someone else, whether it be your partner, whether it be your friend, play this game. If you were the criminal defence lawyer defending them and they're on death row, how would you be turning up for them? What level of compassion and love and consideration and benefit of the doubt would you afford them? Now this is just a mind experiment, this is just a game, but it's giving you access to a resource based out of love that you've always had access to, that you're just maybe not choosing to activate. So this is a powerful game and I recommend that you actually play this. Whenever I hop in my car I actually do this, I'll actually be driving around in my car and I'm playing the game of I'm the defence lawyer, and if anyone cuts me off in traffic or if there's any honking or if there's any poor driving, I'm just going, I'm imagining how am I defending them. Well maybe they're having a bad day, maybe they haven't had any driving lessons, maybe they're stressed, maybe they're drunk, maybe all sorts of different things. I'm now giving them the benefit of the doubt. It doesn't mean I agree with their driving, it doesn't mean I agree with it, but what it does do is it eliminates the negative charge, it just lets it go. So this is another powerful strategy I recommend that you do as a game and when you gamify this, let it go, it just lets the pressure go. So test it out, try it out and let me know how it goes for you guys. Some others strategies just before we wind up is I recommend on a daily basis you reflect on all the trigger moments, all the moments where you got triggered, all the moments where you indulged in some kind of judgement , or negative emotion. Any negative emotion that you experienced. If you can unpack that negative motion, there's absolute gold inside that negative emotion, because you'll see in every negative emotion there is judgement . In every negative emotion there is judgement , it doesn't matter what negative emotion you're talking about, there will be a judgement , there will be a diminishment of some part of your reality, could be someone else, something else, could be yourself, could be a character trait, there's always an element of judgement present. Now you've got to unpack what is the judgement . You might have just judged a thought that popped into your mind, I've judged an emotion. There might be a resistance to thinking, or feeling certain things. I recommend you reflect every single day on your experience, and on reflection of your experience, you will gain access to the gold that exists inside of you. And you can move beyond every single challenge that you've ever experienced, because all the information of the challenge is contained inside your experience. You emotion is a clue, in fact not only is it just a clue, it's the most powerful tool that you have access to to completely unpack all parts of your experience and for you to evolve. When you truly understand these concepts, you can evolve faster in one year than a lot of people doing seminars and personal development will achieve in 10 years, this is powerful, this is absolute gold. Thanks Angela, thanks Dora. So guys, you really just have to trust me when I say that journaling and reflecting on our day and reflecting on negative emotions, it's not just journaling for the sake of journaling and just kind of ticking a box, it is the highest level of self-introspective expansionary process because if you diagnose and if you confront all of the challenges inside your experience, as I said, all the information that you need to evolve and move beyond that limitation is contained within that emotion itself. All the data is contained in that when you reflect on it, you'll get all the information that you need. You don't need a guru or someone outside of you to share with you what's taking place. If you have that ability to reflect on it, you can unpack it yourself. So journaling is an incredibly powerful process, and if you're not currently doing it consistently every single day, then you're at a serious disadvantage in life. Life is hard enough, we need all the advantages we can get. So I definitely recommend if you're not already doing that set it as a daily principle, as a standard, as a code of conduct for part of your experience and the benefits are going to be exponential in your whole entire reality. You're going to earn more money, you're going to have better quality of relationships. You'll have better health because this is something that applies to every dimension of your life, powerful. I'm going to leave it there for tonight guys. We've obviously covered some pretty deep topics. Anyway, as I said, this is a really powerful concept when you apply it, when you go through the journaling, when you look at the introspective processes about what are the negative experiences you're having, where are the judgments, what are you judging about yourself, what are you judging about others. When you've figured this out you'll find that this is going to set you free, this will liberate your from the prison of your mind and this is a powerful concept. All these concepts that I'm sharing with you, I'm sharing them with you because they're powerful, I wouldn't be sharing these with you for any other reason if they weren't important. So for those of you that are also interested in taking this further, for those of you are that are interested in mastering your consciousness, becoming even more powerful in terms of your ability to manifest results, earn more money, be more productive, perhaps maybe even start a business or be more masterful in your business, I have launched my flagship online inner circle called Project Limitless. And this is where I get to go to town giving all of the best stuff that I give my personal 101 clients, so this is a forum, this is an inner circle, this is a living workshop where we get to go through 12 powerful weeks of unpacking the most powerful concepts that I have, taking this a level deeper. Now if you like what you've got on Transformation Tuesday, well wait til you get into Project Limitless, because that's where the good stuff happens, that's where the advanced content happens, that's where all the magic is going to go down. So if you resonate with all the principles and teachings that I'm sharing with you and you want to go more advanced, if you want more powerful concepts, understandings, teachings, and better results in your life, then send me a message, I'd love to have a chat to you to see if you might be interested in coming along and being a part of that programme. It's 12 weeks, it's going to be an intensive life transforming experience, so it's not for the faint of heart, it's for people who are really wanting to create a vertical leap in their consciousness, for people that are wanting to get out of the limiting beliefs, out of the fear based expression, out of the limited mindset that a lot of, unfortunately, a lot of our society and our culture is conditioned into us, which is well, we need to work harder. Well I'm all about working smarter before working harder, and I'm also all about elevating our consciousness to the level such that a lot of our problems dissolve because our level of thinking and our level of awareness has evolved, so this is my flagship programme. This is my life's work, and this is going to be a powerful 12 weeks of radical life and business transformation. So if it resonates with you, if you want more of the good stuff, send me a message and we'll have a chat afterwords. Anyway guys, thank you for tuning in. Thank you Dora, thank you everyone for being part of this episode. I look forward to sharing more life transforming tips with you again next week. As always, lots of love, I look forward to seeing you all again soon, thanks for tuning in. Bye for now.